How To Support Effectively With Blue Wristbands? How Blue Wristbands Help To Support Awareness Campaign? What's in a color? Everything! The world is full of color, and when it comes to awareness, every color has a special meaning. Whether it’s on a magnet on the back of your car or in a custom wristbands, colors communicate an important part of your message. 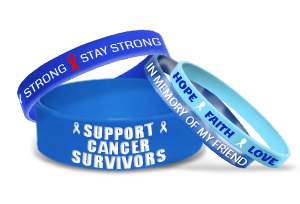 Blue color wristbands may be the perfect fit for your awareness campaign. What Do Blue Wristbands Symbolize? Blue typically represents feelings of trust, loyalty, cleanliness, and understanding. Did you know these interesting facts about the color blue? Blue is the most common favorite color of all people. Greeks believe that blue wards off evil. Shades of blue are described as shallow or deep instead of light or dark in China. “Prince Charming” is called “The Blue Prince” in Italy and Spain. At AmazingWristbands.com, you can create custom blue bracelets for your awareness campaign. To make your product really stand out, use a second color as an accent or add glitter, swirl, a segment effects. Use our online builder to create your personalized blue silicone wristbands. If you need help, just give us a call! Here’s what you can expect from us. No minimum order requirements for popular styles. Our wristbands come in a variety of sizes and widths, including half-inch bands, thicker one-inch bands, and adjustable wristbands. We also offers popular slap bands that “snap” to a person’s wrist, USB bands, silicone rings and silicone key chains. Create yours today!